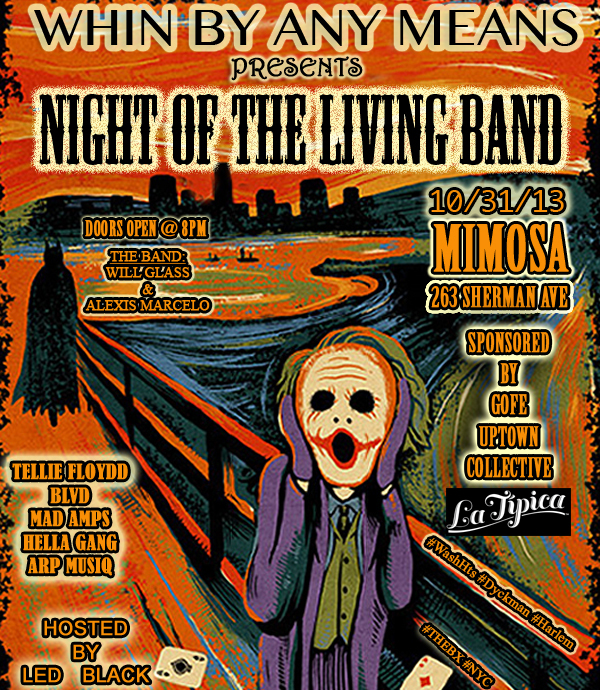 Okay, so this is how it is going down tonight – Halloween Night – at Mimosa (263 Sherman). 5 Acts; Tellie Floydd, BLVD, Hella Gang & Mad Amps backed up by the one and only Will Glass on drums and the silky smooth styling’s of Alexis Marcelo on the keyboards. As well as a whole host of special performances. Not to mention that yours truly will be hosting the festivities. Can’t forget that the good folks at La Tipica Mamajuana have blessed us with their incredibly awesome Mamajuana that will flow freely tonight. That is how WHIN By Any Means does it. So on Halloween Night, the only place to be is Mimosa. Doors open at 8 pm – Show begins promptly at 9 pm.